IdeaJam.net is a great forum for the Lotus community to share their ideas on improving the Lotus software and voting on your favorites. It gives IBM great feedback for what we really want. And as smart as the few dozen developers at IBM are, most of the best ideas are bound to come from the thousands of us who use the software in ways they never considered. So what’s about to happen there that is so amazing? First, it just surpassed 4,000 ideas submitted! Over 10,000 comments have been made on those ideas. With a mindshare like that, IBM has an incredible resource that no other software or software company has — FREE. It’s combining the innovation of open source with the financial strength of private industry. Wow! Now here’s the bad part: It looks like people aren’t contributing as much lately as they have in the past. Why aren’t you voting? Are you disillusioned because you don’t think ideas posted there are making it into the product or having any influence? Well, yeah. Me too. And I think it’s because IBM is not participating in those discussions. IBM, we need to know you’re listening. Just being lurkers that read but don’t respond leaves us guessing if you care or if you are paying attention at all. IBM, if you value this rare input from your customers, then show it. If you have been to the last two Lotuspheres and attended the “Ask the Developers” or the new session titled “Ask the Product Managers”, then you’ve heard me present ideas that got good applause from the audience. Those ideas came from IdeaJam. They were already proven to be very popular. Several of those ideas have been added to the product. One in particular is the feature to block replication if a replica has not replicated within the purge interval. This is coming in 8.5.3. Check out the ideas of the top innovators and take the time to vote. IBM, you need to step up to the plate too and start being more responsive to your community or people will abandon it and you can kiss this great asset goodbye. A split perspective on Quality. Does Quality really matter? I came across this great article “Defining Quality” by Seth Godin discussing just what quality is and how it influences the success of a product. Seth describes the two types of quality: Quality in Design and Quality in Manufacturing. These two are as different as a brand new Bentley and a one-year-old Honda Civic. He also applies these concepts to the software industry. “The balance, then, is to understand that marketers want both. The issue that you may have experienced with corporate decisions about messaging software obviously carries over to just about everything else too. For those of us in the software industry who deal with CFOs who make seemly illogical decisions to switch software, (and make no mistake about it, it is the CFO more often than anyone else, who makes that decision) you are not alone. So if you find yourself trying to fend off the arguments for switching your messaging software, don’t think that they care whatsoever about which platform has more features or is easier to maintain or is more reliable. Before you try to make a case based on those points, you need to ask those most senior decision-makers just what really is important to them. Be careful of the mid-level managers filtering their responses too. They may be telling you what they think is important to senior management rather than what is truly important. If they really knew the pain points of the CFO, they would have already addressed them long ago. You can also read more about this factor in influencing decisions in the book “Neuromarketing: Understanding the Buy Buttons in Your Customer’s Brain” by Renvoise and Morin. Regardless of your profession or position, you should arm yourself with an understanding of how those decision-makers make decisions and how they are influenced. Comments Off on A split perspective on Quality. Does Quality really matter? Working with Microsoft: You don’t know what you’re missing. Yes, you don’t know what you’re missing. I’m not talking about what it’s like working at Microsoft. I am enjoying it. I’m just talking about using the software. Whether you’re a Lotus groupie or a Microsoft fanatic, you’re missing something either way. I always knew this, but now I’m getting the deep dive with a perspective like no one else in the Lotus community has. Here is a taste of some of the differences I have identified after using Microsoft tools the way the experts use them. 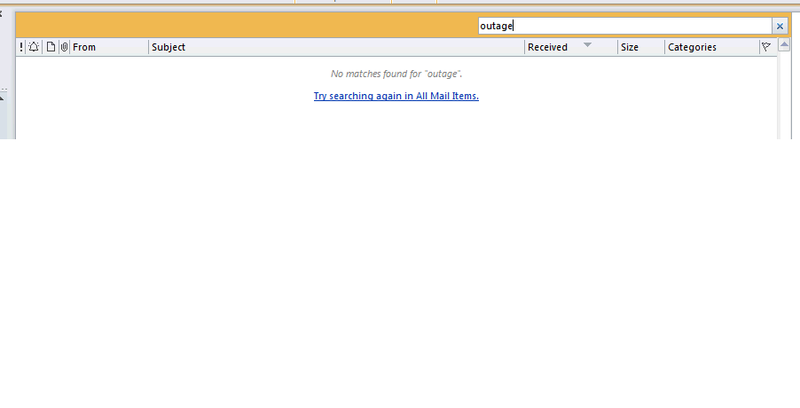 I can categorize messages in Outlook. This is effectively their way of tagging.. Yes, the categories can be renamed to something meaningful. Cleanup – Conversation: OK, now we’re talking. This is a cool feature! It gets rid of all the previous messages in a conversation so you just have the latest one that contains all the history in it. You can run it on a specific message, a folder, or a folder and all its subfolders. This feature was created by someone who got tired of dealing with all the ‘Reply to All’ messages that quickly filled their inbox. Yes, the philosophy is send your message to everyone you know and then always use ‘Reply to All’. The idea is to be sure everyone knows what’s going on. Personally, I would use discussion forums. I can click an option to Ignore a conversation which sends all future responses to the selected message to the Deleted Items folder. Handy for those conversations I mentioned that you somehow find your name was added to the thread that don’t really interest you. But dangerous because you never know when that conversation will have been directed at you and you will miss it. OneNote: Like the Journal in Notes. I haven’t explored this much yet. I like my Lotus Notes Journal since it is synchronized with my BlackBerry. OCS (instant meeting and unified communications) has a great feature that shows the entire chain of command for a person so you can see where they are in relation to you in the company. 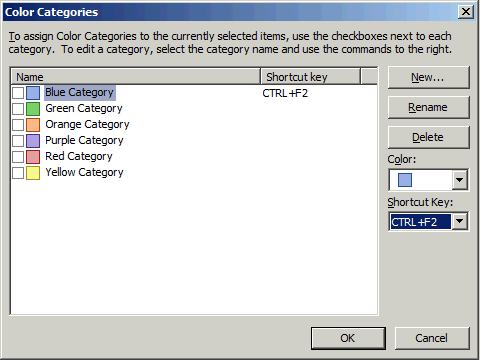 Classic pulldown menus – I hate this ribbon thing in Office. I would even live with that stupid animated paper clip if I could just get the classic pulldown menus back. Swiftfile – That great, free add-on that determines the 3 folders you will most likely want to file a message, then puts a link for each of them at the top of the message so filing the message is one click away. Outlook has a Move feature in the ribbon that let’s me pick from a list of 10 recently-used folders, but there is no other intelligence built into the folders offered and it’s not one click. Reply and include the attachment for editing – There is no way to include an attachment in a reply and edit the attachment before sending. Attachments must be saved from the original message, edited, and then re-attached to the reply. There is no way to put attachments in a specific location within the body of the email for contextual relevance. How can I customize the mail file design? Widgets. I want to build my widgets and use the Google widgets again. I expect there is a way to do this if I wanted to write some C# code. Doclinks – Oh, how I miss doclinks! The Microsoft way is to use URLs. But URLs don’t work for everything. It can’t create and send a link to something in Visual Studio or Product Studio or other software. Only things that are reachable with a browser can be hyperlinked. I find myself doing a lot of copy/pasting. Not to mention Notes doclinks will go to a replica of a database if you don’t have access to the specific location referenced when it was created. Oh, how I miss doclinks! Spell checking in Lync (instant messaging). I can’t view messages in the Deleted Items folder sorted by date/time deleted. So if you just deleted a message by mistake, you have to go hunt for it. Good luck. The selection tray like in Notes views and folders. The column on the left of every view where you can click to select a document or click and drag to select many. In Outlook you have to hold Ctrl or Shift when adding to a selection and if you slip on holding the Ctrl or Shift, you have to start over because the selection is lost. Message encryption. I can’t encrypt messages. That’s’ bad considering I have to email passwords on occasion. I know there are tools to do this, but encryption should be an intrinsic part of messaging. Tabbed windows. 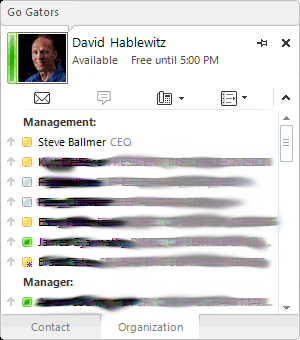 If you open a message in Outlook, it creates a separate window. I like the tabs in Notes better. Being able to add recipients by clicking Reply to All after first clicking Reply without having to go back and start over from the original message. Being able to scroll through the directory to browse a list of groups or people (without having to bring up an address dialog). Ctrl-Break to interrupt processing. Outlook hangs as much as Notes does. At least in Notes I could usually type Ctrl-Break to get focus back. Not so in any Microsoft software. All Documents view. There is no one place to go and see all of your messages. This means you have to search or scan through each folder separately. Suddenly filing messages into folders becomes a liability for remembering where you filed it! Save as Draft button. 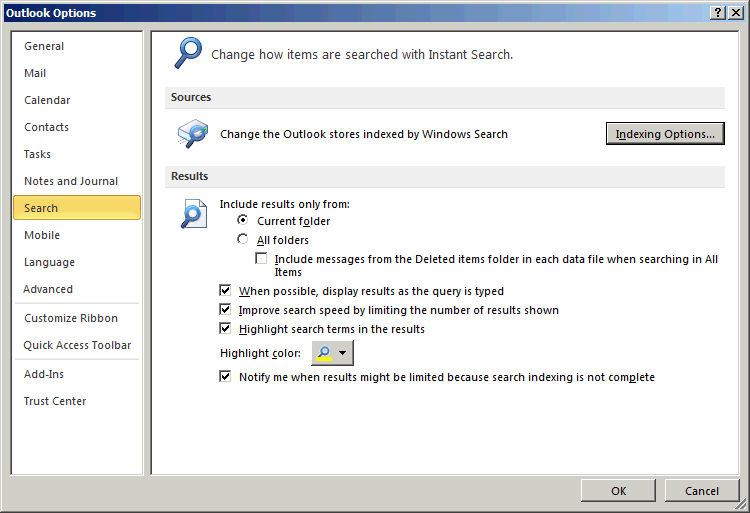 In Outlook, you close the message. Then it prompts if you want to keep the message in drafts. NOT intuitive. Ability to reorder folders to put them in the order you want, not only limited to alphabetical order. I find myself naming folders to affect their sort order rather than to make sense. Left double-click to edit a document (or message or other file in Microsoft world). Discussion and teamroom databases. Yeah. How basic is that? Get all this email out of my Inbox! Don’t reply to all. Just post a response to a msg in the discussion where I can see the entire thread. Doclinks in the message header linking to the previous message within an email thread. Quickr Connectors to get the attachments out of my mail file and into a common place to share them. We do have Sharepoint, but it doesn’t work that way at all. Also, if you are looking at one of your files in Sharepoint and copy the URL to share with someone else, it probably won’t work for them. The ability to make an app quickly. OK, eventually I will learn the other software tools, but I need an app that was very simple to create and deploy in Notes. I have asked around and no one really knows how to do that using Microsoft software. One suggestion was to use InfoPath and Sharepoint. Did I mention doclinks? Wow, I never realized just how much I used them before. It really is all about the apps, isn’t it? I have much to learn about the Microsoft software suite and I am sure I will find more things I like about it. But my personal preference is still Lotus Notes, Domino, Traveler, Sametime and Connections both from the system administration and development perspectives as well as the end user perspective. The cool thing is I’m getting to experience Microsoft software as implemented by the experts. Time will tell how that will influence me. And the reality is as long as I want to live and work in the beautiful Pacific Northwest, I have to accept the fact that Microsoft is my only choice at work these days. IBM doesn’t sell those products around here any more. Ed, I hope you are more efficient at writing your blog entries than I am. Such a carefully worded article for me would have taken me forever to write. To nit-pick: IBM is the “3rd most valuable brand”, not 2nd. Though I’m still not sure what that means. If you look at the list (Apple, Google, IBM, MacDonald’s, Microsoft, Coca-Cola, AT&T, Marlboro, China Mobile, GE – See the source: Brandz article on Most Valuable Brands ) All but one of these brands brings to mind a specific product: IBM. What good is a brand if it’s product(s) are unknown? I completely agree with you that “product management does not drive branding.” It shouldn’t. Product management should be focused on what it knows best: software engineering, not marketing. Though by default, Ed, you are the mouth and face of the Lotus brand since all of this marketing news is coming from you, not from Sandy Carter, the VP of marketing. I admit that I am more guilty than most of targeting you with points on marketing awareness when I really should be directing that energy toward Sandy. But hey, you’re a more visible and accessible person and we all appreciate that. I can think of no other company that has such a transparent approach to their product development and direction as IBM has with its Lotus brand. Even other IBM product communities don’t have such transparency or stir such passion. But honestly, we don’t so much care about the transparency as we do about results. It’s much like the way a boss or parent will micro-manage when they aren’t getting the results they expect and will be more hands-off when they do. Right now the Lotus community is trying to micro-manage IBM because it doesn’t have confidence in your current strategy. This community wouldn’t be so involved or vocal if their careers weren’t so closely tied to IBM’s success. It’s no fun to be a stakeholder yet have little voice in the process beyond commenting on your blog or writing on our own blogs. I believe the American Revolution started for the same reason exactly 235 years ago. That is the independence theme in “screw IBM, let’s buy the product back from them” . I didn’t see the post, but I’ll bet the author was an American. Ed, in all of my studies and research on marketing, there are 3 books that I have found that stand out to address this issue best. You already know the first one: “Influence: The Psychology of Persuasion”. The second is “Neuromarketing: Understanding the Buy Buttons in Your Customer’s Brain” by Renvoise and Morin (terrible title, great content). Don’t read it unless you’re interested in expanding your knowledge on selling, but do at least share it with Sandy. I’m just glad I branded myself as “The Notes Guy in Seattle” instead of “The Lotus Guy in Seattle”.